1. Use foam floor tiles for a softer, more comfortable tent floor. 2. Point a head lamp into a jug of water for an instant lantern. 3. Also: Mountain Dew + baking soda + peroxide = lantern. 4. Make tin-can sandwich bread as a portable food option. 5. Familiarize yourself with what the poisonous plants look like. 6. Bring a tick deterrent. 7. Glue sandpaper to the top of your match holder. Be sure to buy strike-anywhere matches. 8. Repurpose a coffee can to hold and protect TP. 9. Make crescent rolls over the campfire. For maximum yumminess, fill ‘em with stuff like marshmallows and Nutella. Or wrap hot dogs with them. 10. Use Tic-Tac boxes to store spices. 11. Invest in a two-person sleeping bag. This one is $84.99 from Cabelas. 12. Get these seat hammocks for car camping. 13. Cut up a straw and fill the pieces up with antibiotic ointment or toothpaste for single-use packets. Use a lighter to seal up the ends. 14. Make travel coffee bags out of coffee filters and dental floss. Place a scoop of coffee grounds into a coffee filter and tie it up with dental floss. When you’re ready to brew, just make it like you would make tea in a teabag! 15. Need your coffee? Bring a few of these. They’ll keep you from going into caffeine withdrawal. 16. Make candle stakes for romantic nighttime lighting. 17. Make single-use soap leaves from a bar of soap and a vegetable peeler. You can also rub soap on mosquito bites to relieve the itchiness. 18. Use an empty laundry detergent dispenser as a hand-washing station. Just fill it up with water. 19. Use a belt and hooks to hang up pots and pans. 21. Pack a mini first-aid kit into an old prescription bottle or Altoids tin. 22. Make pancakes with pre-made pancake mix using shortening and dry milk, which don’t need to be refrigerated. Get the full recipe here. You can also find powdered eggs at most grocery stores (if you don’t shudder at the thought). 23. Put a battery-powered votive candle into an empty peanut butter container to make portable lanterns. 24. Make a portable washing machine with a plunger and a bucket. 25. Make an easy-to-carry fire starter with a cardboard-only egg carton and match light charcoal. You just have to light the carton and the fire will catch on to the charcoal. 27. Make pocket-sized oil lamps out of travel-size or hotel toiletry shampoo bottles. 28. Forgo the meat marinade and put the rosemary right on the coals. Once the coals are uniformly gray and ashy, cover them with fresh rosemary branches. Your meat and vegetables will be flavored with the taste of savory herbs. 29. Bring cheeses in waxed packaging as well as hard cheeses. Aged cheddar, Parmigiano, and/or Gruyère will keep for at least a week unrefrigerated. 30. Add bundles of sage to a campfire to keep mosquitoes away. Sounds crazy, but it’s actually delicious. Crunchy on the outside, warm and gooey on the inside. Roast it until it’s bubbling. 32. Forgo pasta for a quick-cooking alternatives like polenta, quinoa, or couscous. Polenta is especially versatile because it can be shaped into patties and pan-fried for a sweet or savory meal. Get a recipe for grilled polenta cakes. 33. Cook cinnabuns (the canned kind) in a hollowed-out orange over a campfire. 34. If you’re going to be hiking, use this biodegradable trail-marking tape. 35. 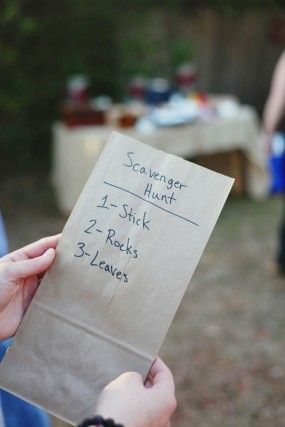 Keep the kids busy with a scavenger hunt. Write the items down on a paper bag so they have a receptacle for the items. 36. Use a bucket and a milk crate as an emergency toilet. 37. Cotton pads dipped in wax are a crazy easy way to make portable fire starters. 38. Bring microfiber towels — they’re super absorbent and lightweight. 39. Freeze gallon jugs of water and place them in your cooler. They’ll keep your food cold, and you’ll have plenty of water to drink for later. Other things you can freeze to use for later: pasta sauces, chili, and pesto. 40. Make emergency light sources out of an Altoids tin, cardboard, and wax. 41. Make sandwiches with this campfire panini press. No matter how far you have to carry this thing, YOU NEED IT. Get it here for $25.95.